Well, here we are at crunch time, and here I am at 2:30am again blogging! Things are coming together slowly and quickly at the same time. We have a great base of volunteers for all areas of our day, the exception being hair and makeup in the afternoon. But I am sure that these will also come together in the 2 remaining days as we have been working on filling the spots. Laura will be at the church on Friday evening to set up a few things with those who are willing to come in and do it then. For all others, it will be a mad rush at 8am Saturday morning. Please, if at all possible, avail yourself for a group photo (or possibly a few) before we start our day. If you are one of those who are starting later in the day, please make sure you have your photo taken so that we can try to add you to the group shot afterwards. Anyone who knows anyone who is willing to bring along food, we would be very very grateful for anything. We do have quite a bit of food, but based on last year's experience, we can always use more. Savoury things like sandwiches, pizzas, veggies, meat and cheese trays, and fruit (a box of oranges would be great!) are where we are lacking more. Please also remember to label any dishes or things that you want to get back at the end of the day. We have made a tentative schedule for the volunteers and have emailed a couple key groups of people who need to bring specific equipment. For the rest of you, if you are a photographer, please bring your cameras and flashes etc, and if you are a general volunteer you will be told where to be on the day of. Anyone who has funny hats or things to make kids laugh, bring those along, or any other props that may be useful (remembering to label everything!) When you arrive, please see Simran Bains, our volunteer coordinator, who will let you know where you need to go and what you need to do. Laura and Tamara will be everywhere at once ;-) and I'm sure things will be great! There are probably going to be media there as well as several photographers taking candid photos for us. Be aware you may be on camera, and also please be sensitive and aware of guests who are in situations that require confidentiality. This year there are A LOT of these individuals. We have close to 100 amazing volunteers. Feel free to use the opportunity to network with each other and to learn from each other. So far we have around 300 people registered to have their photos taken, with more on the way, as well as walk-ins on the day. I am guessing we may hit close to our target of 500-600 people. The day holds great promise. Looking forward to seeing you all there! 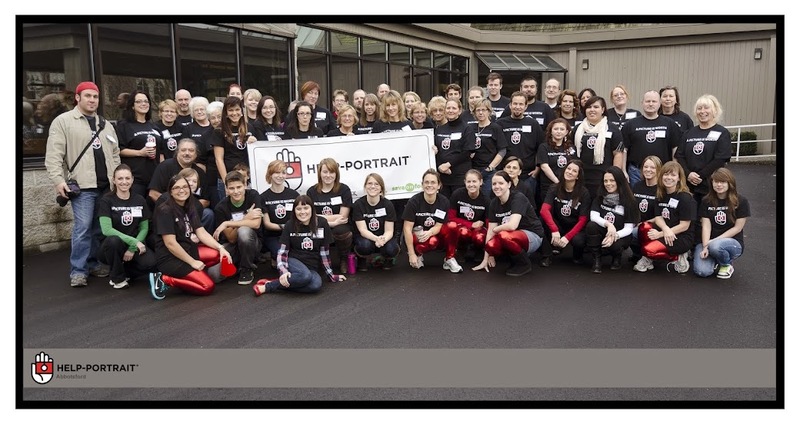 Last year was our first attempt at an Abbotsford Help-Portrait event. We were pleasantly surprised at the success that it was, but most of all, we had a super fast learning curve and came away with many ideas for the way we wanted this year's event to be run. Having said that, we have already encountered areas that could be changed and better managed for next year. This blog is one example. It is constantly being modified in small ways to suit our purposes and enable a more fluid event planning and execution. Today's addition is something that I will definitely include at a much earlier date next year to facilitate guest management for our event. I was going to wait to add the Guest Registration to our next year's TO DO, but then I thought, why not just do it now anyway? So here we are, scrambling to ease the craziness of the next 9 days.... If any of you know of individuals or families who would benefit from being served by us at this event, please send them to our blog to fill out a simple form to let us know who they are. Once they have filled in the form, they only have to wait for one of our great volunteers to contact them to make an appointment on the day. 9 DAYS AND COUNTING PEOPLE!! !